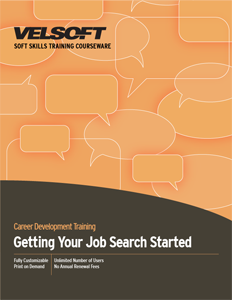 Job Search Training Materials are design for teaching those entering the workforce how to effectively get their job search started! Train the class how to recognize their skills and abilities, develop network opportunities, job searching strategies and more! Seeing is Believing This sample manual to teach Getting Your Job Search Started is in MS Word format. While looking for work can be an exciting time, it can also involve fear and discomfort about change and the unknown. Whether participants are already in the midst of a job search or just thinking about it, this one day workshop will help students get their job search started by determining what their skill set is made up of, the kind of work that is important and realistic to include in their search and more. Today's job market is not the same as it was even five years ago. Knowing where to go, who to talk to, and the opportunities that are available will help to shift them from someone who dreams about having a job, to someone who has the job they always wanted.